The small population of approximately thirty grizzly bears in the Selkirk and Purcell Mountains of northern Idaho and eastern Washington State is one of the last five remnant populations of these magnificent mammals in the lower 48 states. The Selkirk Grizzly Bear Recovery Project of the Idaho Fish and Game Department has been working to study and conserve these bears since 1983. However, the Idaho Fish and Game operations are funded almost exclusively with revenues from the sale of hunting and fishing licenses. These funds are insufficient for the study and conservation of all non-game species. The three officers running the Selkirk Grizzly Bear Project were thus critically short of funds and manpower. 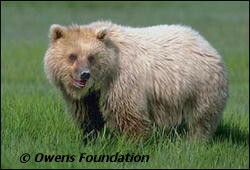 Between 1997 and 2002, the Owens Foundation provided financial and technical support for the Selkirk Ecosystem Grizzly Bear Recovery Project of the Idaho Fish and Game Department. This assistance provided much needed equipment and manpower that enabled the Selkirk field personnel to continue their mandate of protecting and conserving the grizzlies. The Selkirk Project seeks to quantify the population density, reproductive biology and causes of mortality of the grizzly bears that live in these mountains. The research has shown that in the past the Selkirk population could not sustain the rate of man induced mortality that in some years constituted half of all Selkirk grizzly bear deaths, and was the main cause of this population's decline. However, since the project's inception, human caused mortality in Idaho has dropped, offering hope for a full recovery of grizzly bears. The Selkirk ecosystem is one of the most completely grizzly bear habitats in the lower 48 states and includes. The Selkirk grizzlies may recover if human caused deaths and habitat losses can be contained. The Owens Foundation provided funding which attracted matching grants to support the salary of the Idaho Fish and Game Conservation Education Officer so that the position would become permanent. Education has proved to be one of the most effective grizzly bear conservation tools. Thousands of people have been contacted during field patrols, through presentations to civic groups, in schools, sportsmen's groups and conservation organizations. The rate of man caused mortality has declined since these education, research and law enforcement programs began. In addition, the Owens Foundation provided funding for grizzly bear trapping and collaring with radio transmitters to allow field biologists to track and study the Selkirk grizzlies. The Foundation provided the radio collars and manpower for such projects and for grizzly "Hair Snares" that collect hair samples from wild bears passing through the area. The DNA of the hair specimens is analyzed and provides data on population dynamics. The data obtained from radio tracking and hair snare analysis helps determine the range movements, habitat usage and social interaction of the grizzlies. It also helps Idaho Fish and Game develop better strategies to protect the people and the wildlife of North Idaho. Since 1983, biologists of the Idaho Department of Fish and Game have conducted baseline ecological research on the Selkirk grizzly bear population, introduced a bear conservation education program to the public and established a law enforcement program to protect grizzlies. Since 1983 more than 50 grizzly bears have been radio-collared, and monitored from the air and ground in the Selkirk range including North Idaho, Eastern Washington State and Southern British Columbia. If these grizzlies can be saved, the chances for the recovery of other endangered or threatened species in the region, including caribou, lynx, wolves and bull trout will be enhanced. It was our pleasure to partner with a number of individuals and organizations in coordinating support for the Selkirk grizzlies. We wish to extend particular thanks to the staff of the Woodland Park Zoo of Seattle, Washington for their support in raising funds for the Selkirk Grizzly Bear Recovery Project.